Eat what you love and still lose weight with satisfying, sensible recipes your whole family with love! You can eat the food you love and still still lose weight. One trick is to enjoy your favorite comfort foods made lighter and healthier. 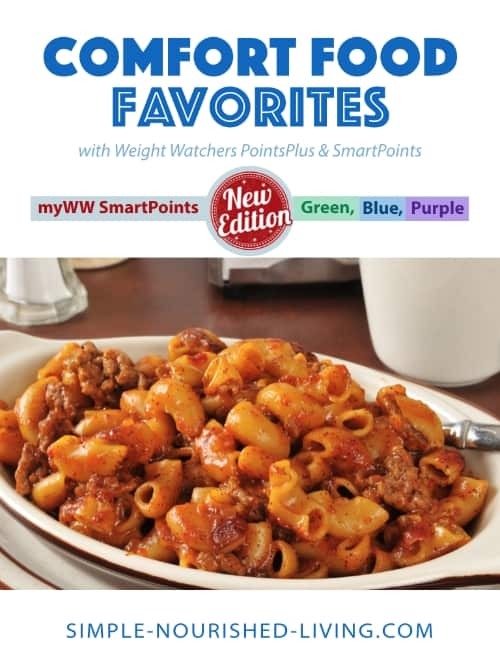 That’s why I’ve written this ecookbook – Comfort Food Favorites for Weight Watchers which includes nutritional estimates, PointsPlus and Freestyle SmartPoints values for all recipes. Please Note: This SmartPoints eCookbook is available in PDF format and can be immediately downloaded right to your Computer, Tablet, or Smartphone and then printed if you want! Lose weight without feeling deprived with a winning collection of scrumptious recipe for Doritos taco salad, baked chicken nuggets, chicken broccoli casserole, mashed potatoes, brown sugar glazed chicken and many more! Martha, I have been reading your emails for a few months and love your insight. That said I had yet to make a Slow Cooker recipe until the Chicken Marsala. OMG are you kidding? It is so fabulous I will make it again and again and again. One certainly does not feel on a diet of any kind eating that. I had sauteed carrots with it. Also, though I am a wine lover, I only had 1/3 cup of the Marsala so used broth as the other liquid and it turned out well. No shallots but used quite a lot of red onion. Anyway thank you so much for the emails and the quotes I love reading those. 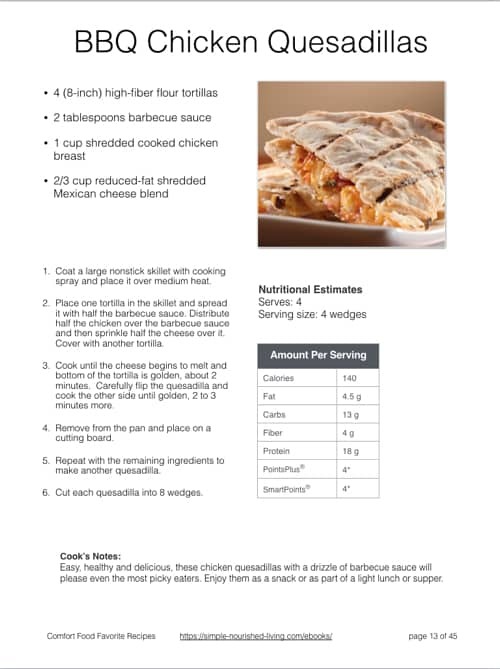 Hi Martha - As a Lifetime Weight Watcher, I have used many of your recipes and found them to be tasty and husband-friendly - especially your Skinny Slow Cooker Recipes! Martha - I have been on WW for about two months now, and progressing well, albeit slowly. But I just wanted to tell you how much your personal blog has helped me. And the menu ideas for July 4th week are exactly what I prepared for Father's Day! Keep your ideas coming along with recipes because we don't usually like to eat the same thing more than once, unless it's really, really good. Thanks again! I Feel Good & Still Have A Long Ways To Go, But With Your Help I Think I Can Make It! I have been on WW for years, off and on for too many years to count. (Off being the primary word.) I have never reached goal. So when I decided to try one last time, I was looking for an incentive when I found you! You are that and so much more. I have copied everything you have sent me. I went to the Dr. this week. He went through my labs, (BS was 89, never been that since ?) checked heart, lungs, and ankles for swelling and looked at me and said.... "You have lost 16 pounds also. Do you have a twin?" I assured him that I didn't. I feel good and still have a long ways to go, but with your help, I think I can make it! Thank you so much.